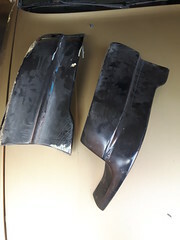 I have an old pair of Border rear spats that are in my garage if they are of use to anyone. These are replica items and made of fibre glass. One of them needs a small repair to the lower section.